For a week or so, winter threatened to make an appearance here in Adelaide. But then it disappeared and we’ve had the warmest couple of May weeks for about 100 years. Which is a shame because I love winter food. I not only love eating it but I love that so often it is the type of food you can prepare well in advance and then just pop into the oven after a long day at work, leaving the cook with nothing more strenuous to do than crack open a bottle of red. 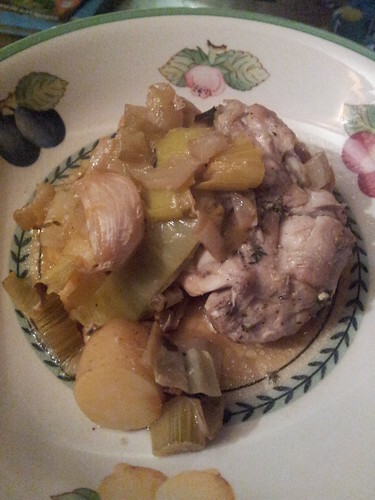 Earlier this week we revisited the leek, chicken and hazelnut pie (yes, all the way back in 2009!) and I’d had to buy a whole bunch of leeks. So now I’m busy using them up. Which isn’t a problem because I love leeks. I also love soup and while it’s not Andy’s favourite thing to eat (by a long stretch) he’ll tolerate it in small doses. 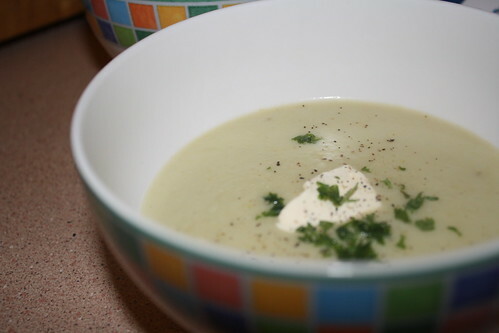 I’d also been thinking about how I hadn’t really used any of my cookbooks for a while so while I didn’t need a recipe for leek and potato soup I had a quick flick through for inspiration. 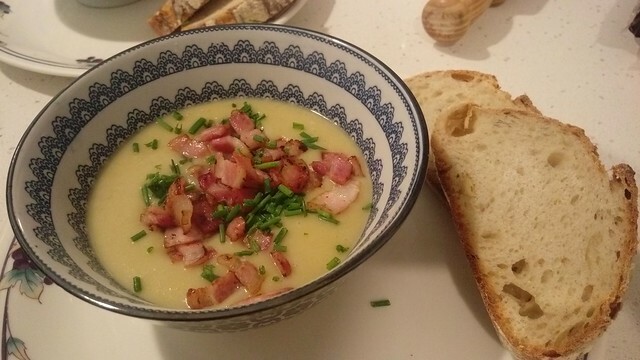 Regular readers will know I have something of a soft spot for James Martin so I was pleased to find a leek, potato and Stilton soup recipe in his book The Collection . An extra bonus was that it was even less work than I was considering! His recipe needed a few tweaks to suit what was actually available so it’s my version that follows. The critical thing here is that it’s a one pot, boil it all up trick. Go easy with the blue cheese: they vary in strength and if you add too much you’ll really notice it! This recipe will serve four. Make sure you have plenty of good, crusty bread to hand! Place stock pot (or cube) and water in a large pot and bring to the boil. Add the leek, onion, garlic and potato to the stock and cook covered (you don't want the liquid evaporating!) until the vegetables are soft. Add half the blue cheese and stir to melt. Then blitz the soup and check the flavour. You need to check the strength of the blue cheese flavour AFTER blitzing as it's the only way of guaranteeing the flavour is through the soup. If you want to add more cheese, go ahead. Finish by correcting the seasoning - it's unlikely you'll need salt though you might want to pass the pepper separately. Serve the soup hot, with a quenelle (that's a dollop!) of sour cream and a sprinkling of parsley. More cooking (yep, those restaurant reviews are still percolating) – and while this dish looks unspectacular it’s incredibly tasty and easy to do. If you’re a cook who’s a little frightened by the idea of roasting a whole chicken, or just someone a bit short on prep time (that’s me!) then this dish is fantastic because it’s quick, requires just the one dish (the one it’s cooked in) and can be all prepped in advance, meaning you just need to put it in the oven about 50 minutes before you want to eat. This is a Rachel Allen recipe that has been on my to-do list for ages. As is so often the case, the cooking time given is woefully inadequate and, with the oven up so high, you do need to be wary of the vegetables in particular burning. However, that is easily solved by popping a lid on part way through cooking. This has the bonus of creating some very tasty sauce that can be served with the dish. Sadly, it is a bit anaemic looking (not just the fault of my photography this time!). If you were so inclined you could flash the chicken thighs on a grill pan prior to serving (being careful not to dry them out though!) but I suggest that if you’re particularly worried about appearance, serve it with a bright winter salad. Potato-wise, we used the most beautiful, tiny kipfler potatoes that Andy picked up in Blackwood from the excellent Waggon Wheels (no website). This always busy fruit and vege shop stocks all the standards but also manages to squeeze in a range of varieties that you won’t find in supermarkets or even other fruit and vege shops. It’s one of my favourite places to buy veggies. Do not be tempted to omit (or peel!) the cloves of garlic. After cooking, the skin comes away easily and the garlic cloves are so soft and so mellow in flavour that they add real depth and warmth to the finished product. This was a big hit – and if you need to throw something together over Easter, I recommend it. Quantities below are for 2 people, with tons of leftovers. Preheat the oven to 200°C fan (220°C conv). Take a large baking/roasting dish - preferably one that has a lid - and put a splash of olive oil in the bottom. Chop the leek into 1-2 cm chunks and roughly chop the fennel. If the potatoes are not evenly sized, cut them into even sized pieces. You want them reasonably small (smaller than a golf ball) so they cook! Add leek, fennel and potatoes to the baking dish with the garlic, season and toss through the olive oil. Finally add the chicken thighs and toss through, ensuring they are also coated in oil. Bake uncovered for about 20-25 minutes. Keep an eye on it to make sure that nothing is burning and then cover with lid and bake for another 20 or so minutes, until the chicken and potatoes are cooked. Serve hot on its own or with a garden salad.